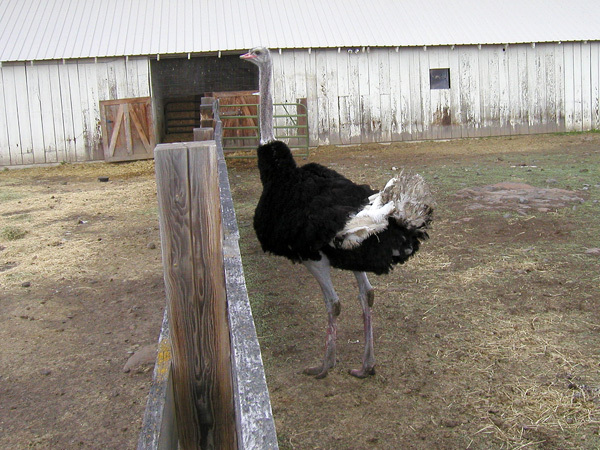 Ostrich and other exotic animals for sale. The Ostrich is a large flightless bird that is native to Africa (and at one time to the Middle East). It has a long neck and legs and the ability to run at speeds of about 65 km/h (40 mph), the fastest and largest of any bird. The eats mainly seeds and other plant matter, and sometimes it will eat insects. It lives in nomadic groups which contain between five and 50 birds. When threatened, the Ostrich will either hide itself by lying flat against the ground, or will run away. If cornered, it can cause injury and death with a kick from its powerful legs. Territorial males fight for a harem of two to seven females during the mating season. 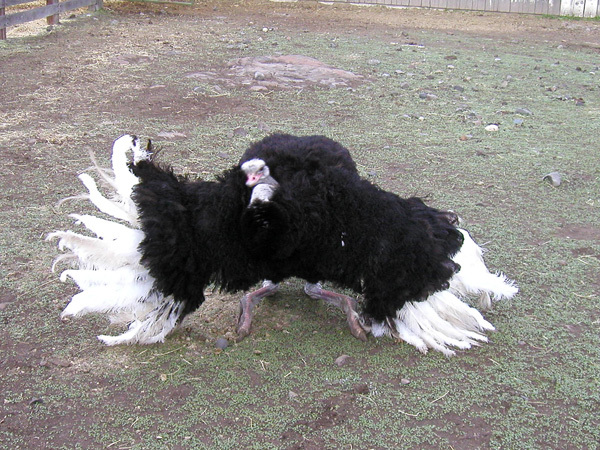 The Ostrich feathers are used around the world for decorative purposes are also used for feather dusters. Its skin is used for leather and its meat marketed commercially. 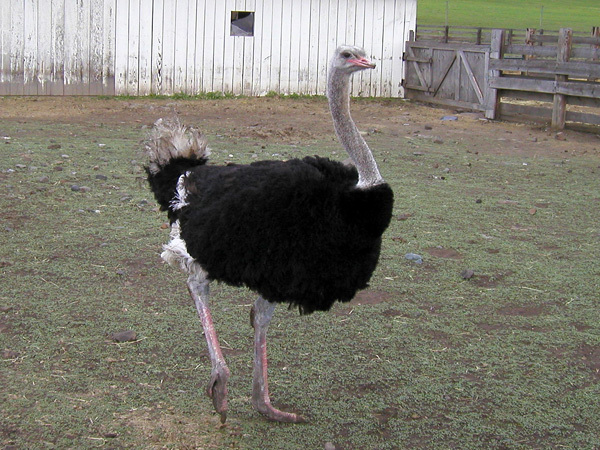 Ostriches usually weigh from 200 to 285 lb (93 to 130 kg) and between 6 and 9 ft (1.8 and 2.7 m) in height. The feathers of adult males are mostly black, with white at the ends of the wings and in the tail. Females and young males are grayish-brown and white. They can live up to 75 years. The bird has just two toes on each foot (most birds have four), with the nail of the larger, inner one resembling a hoof. Their wingspan is over six feet (around two meters). The wings are used in mating displays, and they can also provide shade for chicks. The feathers, which are soft and fluffy, serve as insulation, and are quite different from the flat smooth outer feathers of flying birds. Ostriches are native to savannas and the Sahel of Africa, both north and south of the equatorial forest zone. The Arabian Ostriches in the Near and Middle East were hunted to extinction by the middle of the 20th century. Male and female ostriches live in nomadic groups of 5 to 50 birds that often travel together with other grazing animals, such as zebras or antelopes. Because they lack teeth, they swallow pebbles to grind the swallowed foodstuff in the gizzard. 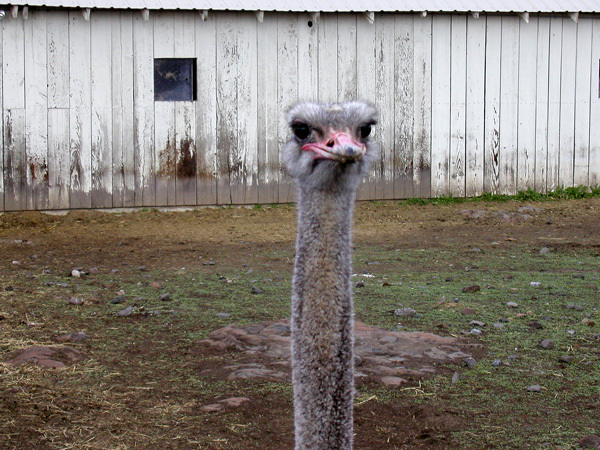 An adult ostrich typically carries a couple of pounds (about 1 kg) of stones in its stomach. Ostriches can go without water for a long time however, they enjoy water and frequently take baths. With their acute eyesight and hearing, they can sense predators such as lions from far away. When lying down and hiding from predators, the birds lay their head and neck flat on the ground, making them appear as a mound of earth from a distance. This even works for the males, as they hold their wings and tail low so that the heat haze of the hot, dry air that often occurs in their habitat aids in making them appear as a nondescript dark lump.